The star V883 Ori hasn’t yet entered what is called the main sequence, which will represent its normal life, and is still unstable so it’s subject to powerful outbursts with energy explosions that bring noticeable changes in its brightness. Together with the protoplanetary disk that surrounds it, it’s already been studied and in July 2016 an article published in the journal “Nature” described the first observation ever made of the water snow line. The ALMA (Atacama Large Millimeter/submillimeter Array) radio telescope, inaugurated in March 2013, was used for that study as well and made it possible to carry out the detections following an outburst of V883 Ori. In this case, the outburst of V883 Ori sublimated icy materials that contained complex organic molecules such as methanol, acetaldehyde, methyl formate, acetonitrile and acetone. 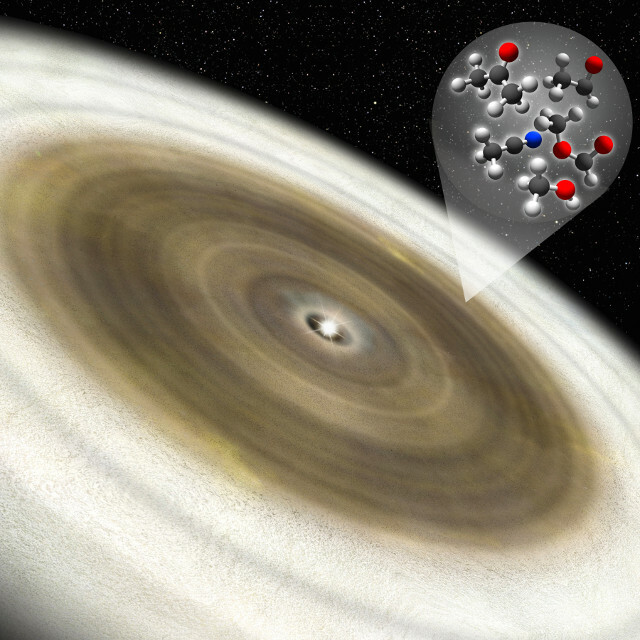 This is the first time that acetone is discovered in a protoplanetary disk without doubts, expanding the number of compounds discovered in stellar systems in formation. Thanks to the outburst and the consequent explosion of energy that expanded the region within the snow line almost ten times, it was possible to detect many complex organic molecules. Jeong-Eun Lee, the first author of the article, explained that it’s difficult to study a protoplanetary disk whose snow line is at a distance that’s only a few times that of the Earth from the Sun. Yuri Aikawa, of the University of Tokyo, another author of the article, added that the chemical composition of solid materials in protoplanetary disks is of particular importance because they’re the ones that make up rocky and icy planets. 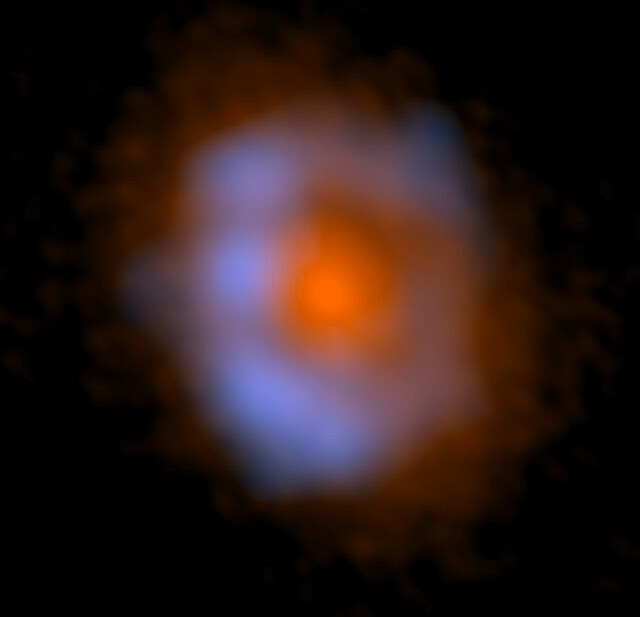 Studies on stellar systems in formation such as V883 Ori are important to understand the processes that occur during the early stages of their life. To understand the potential to host life forms on suitable planets in the future, scientists are looking for water and organic molecules that can form building blocks for their subsequent birth. In this case, methanol, acetaldehyde, methyl formate, acetonitrile and acetone are precursors of amino acids and sugars and therefore fit perfectly into the category of life building blocks. In V883 Ori’s protoplanetary disk, the distribution of these complex organic molecules was detected in a ring with a radius that’s 60 times the distance of the Earth from the Sun. However, most likely they’re also present in the rest of the disk but inside the ring the dust is too thick and obscures their traces even to an instrument as sophisticated as ALMA while outside it they’re still frozen in the ice. It’s possible that comets will form together with planets and those comets will contain those complex organic molecules creating a situation similar to that existing in the solar system.